It’s Darling at Scrapbook Boutique (video)! Hey there, I’m back with another video for Scrapbook Boutique and it’s some more colouring today. Honestly, these Art Impressions images really make me smile and even more so when I get to colour them! Other Supplies: Copics – 0. E000,00,29,31,33,37,49,50,53. W2. T0. R02,20,22,29. RV17. G40. YG91,95. Y11,21,26. YR24. < Previous Just in Time for Christmas! Next > Penny Black Guest Designer!!…. ALL week long! Oh I love everything about this beauty Therese. I love your papers at the top and awesome coloring. Oh this is so super cute! I love it. Look at this CUTE card Therese made to share…! 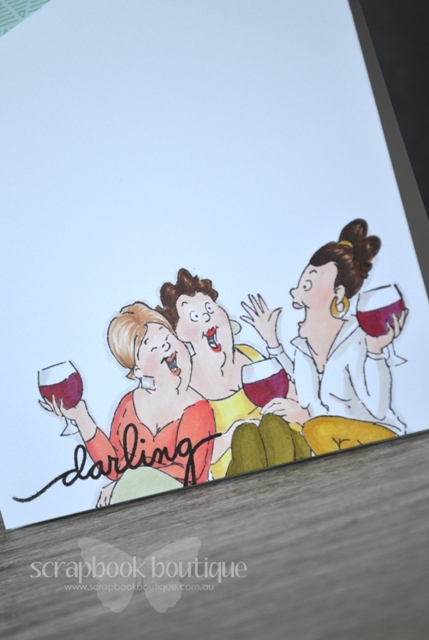 Love this card Therese… Not stamping the whole image is what makes your cards pop!!! That and how you did the shaped papers at the top. Hope you and your family had an awesome Christmas. Wow, you have got some great coloring skills! I love how the simple lines really make that fun image sign right through. Thanks. These images make me smile too. Fab card. such a fun card..LOVE it! 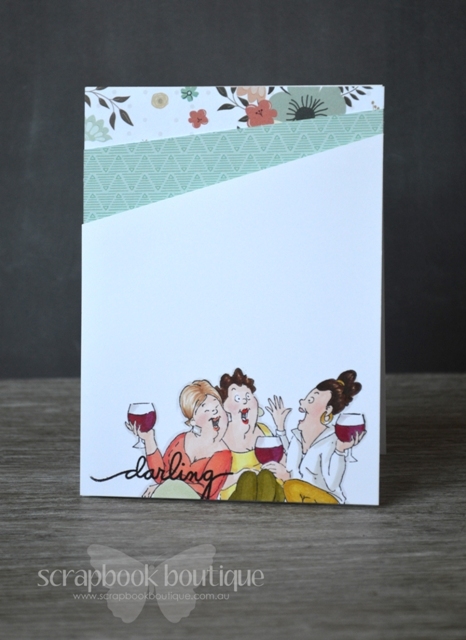 This is such a fun stamp and card! Thanks for all your inspiration this year Therese! Looking forward to more in 2015. Happy New Year! I love the simple way you incorporated the patterned papers. The balance of color between that and the image is perfect! That R02 and R22 is a nice combination, I’ll have to remember that one. Awesome! These images certainly make me smile as well. I love how you have only used a small portion of the stamp. Clever! Awesome! I love that you used only a part of this stamp, it makes the card so different! I love it! From the way you stamped the ladies at the bottom to the papers at the top – absolutely terrific!